Icecream Ebook Reader is an ebook reader that offers you to customize various settings for the most comfortable reading process. In this how-to guide you'll find more information about the settings offered by the program. Click the “Settings” button in the lower right hand corner to open the Settings panel of Icecream Ebook Reader. The Settings panel is divided into 2 tabs: System and Profiles. 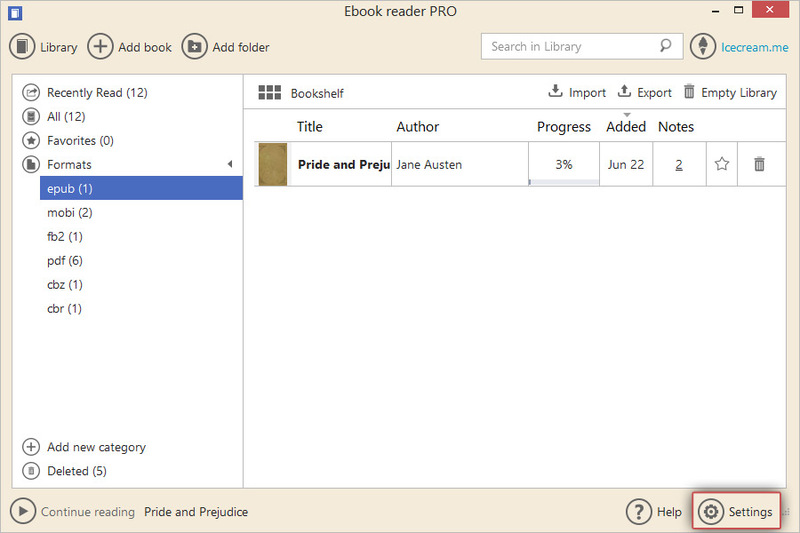 In the first one you'll find the general settings of the program and in the second one – the settings that help you customize the appearance of the books reading process. Make sure you press the “SAVE SETTINGS” button in the lower right hand to apply the changes. Language. Icecream Ebook Reader offers over 45 languages of the interface to select from. Click within the white area to the right of the “Language:” sign to open the drop-down list with all the languages available in the program. Click the right language to apply it as the program's interface one. Library path. This setting specifies the destination folder in which the archive file of the Library is kept. Click within the area with the folder icon to open Windows Explorer and select the right path. Page turn effect. Enable this option to add an animated effect shown while the pages of books are turned forward or backward. Text alignment. Select one of five available text alignment options: Original, Left, Right, Center and Justify. This setting will be applied to the books of ePub, MOBI and FB2 formats. Navigation scrollbar. 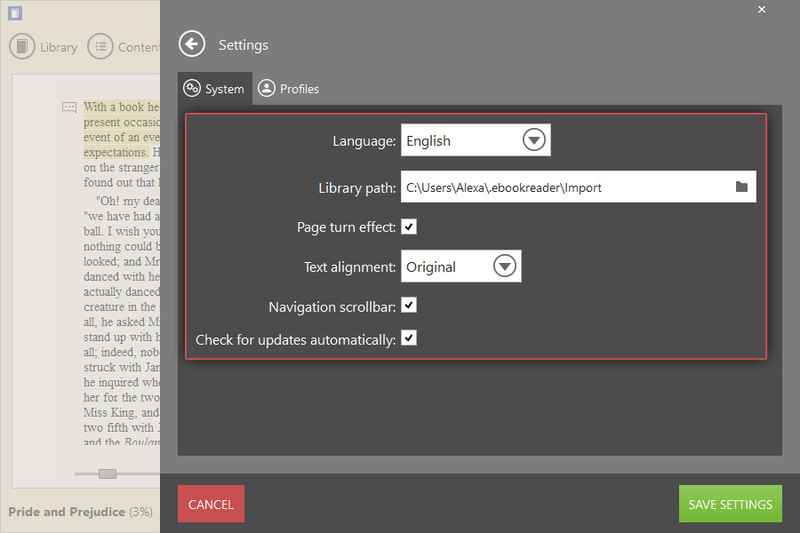 Enable this option to use the navigation scrollbar to fast access the books' pages. Navigation scrollbar is available at the bottom of the book while in reading mode. Check for updates automatically. Make sure this option is enabled to receive program notifications as soon as a newer version of Icecream Ebook Reader is available on the official website. Profile. 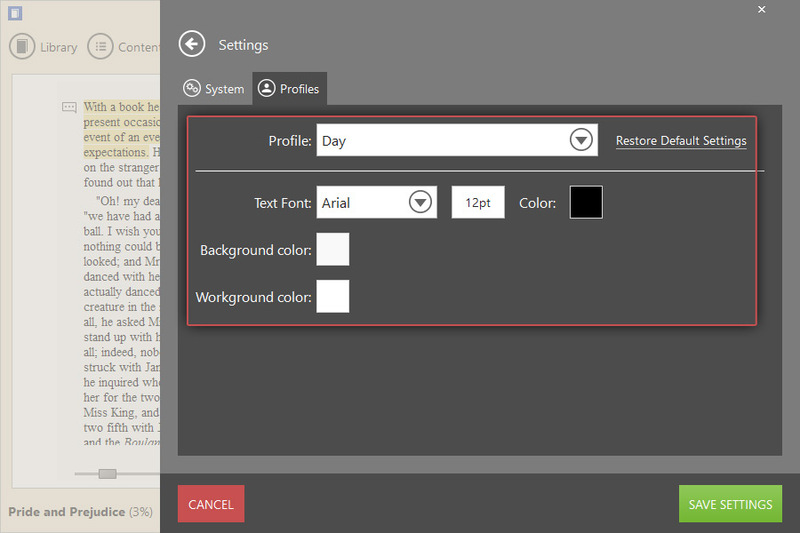 There are three preset reading profiles that are available to select from: Day (color scheme for comfortable reading in the daylight), Night (colors are more suitable for reading in the dim light or at night) and Sepia (the colors are shown in reddish-brown colors). Restore Default Settings. This button located in the right side of the program's panel resets all the custom user settings and restores the original default ebook reader's settings. Text font. Select one of the 8 available text fonts in this option. Select the needed one to change the font of ePub, MOBI and FB2 ebooks. Text size. You can manually type in the desired value for the font size into this field. The program supports 8-32pt sizes of the font. Text color. Click the black square (default color) to select the custom color of the fond of your choice. You can select from basic colors, pick the color or select color by its HTML code. Background color. Select the color of the area that frames the opened ebooks here. Click the square to the right of this option and pick a basic color, pick the screen color or insert the HTML code of the needed color. Workground color. Select the color of the books' pages in this option. Click the white square to choose the right color (the same options are available as for the “Background color” and “Text color” options).